Only Sigmund Freud could probably account for why strains of “Suicide is Painless” (the M*A*S*H theme song – in both the 1970 movie and subsequent TV series) pulsated inside my cranium each time the anti-boycott bill was being rehashed on our airwaves. Resorting to amateur psychoanalysis, I could vaguely work out what led me to regard boycotts as beautiful. I must have subliminally succumbed to all that high-minded leftist palaver about boycotts constituting a legitimate form of free speech. As such, boycotts become a positive expression of human rights. My own appreciation was thoroughly grounded in historic precedent. The benefits of boycotts are undeniable. For example, in the 1870s, the Anti-Coolies Association and the Supreme Order of the Caucasians initiated boycotts of Chinese businesses and laborers across America’s West. Many immigrants sailed back to China. Others fled to San Francisco, home to the largest US Chinatown. It’s sort of reminiscent of the terminology adopted by Israel’s renowned champions of democracy against “settlers.” Do our peaceniks attempt to end all Jewish presence outside the 1949 armistice demarcations, along the lines of what took place in Truckee? Most likely. The upshot of the democratically declared Truckee boycott was that all its Chinese laborers were fired and Chinese businesses withered when customers stayed away. Every non-Chinese emporium in town refused to sell anything to the Chinese. It was their democratic right, wasn’t it? All this forward-thinking culminated in America’s 1882 Chinese Exclusion Act, which barred Chinese entry into the US for 10 years, forced already-resident Chinese to reapply for visas, and permanently denied American citizenship to all Chinese. 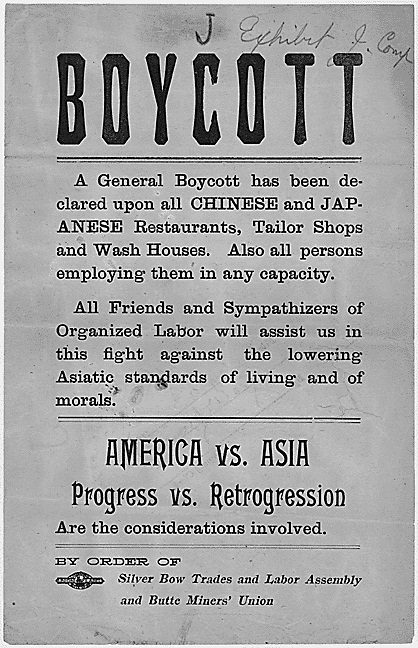 This boycott-born bounty was finally repealed in 1943. Meanwhile, back in Europe, much the same sentiment raged against very veteran Jewish communities. Poland managed virulent Judeophobia even before it gained independence in 1918. Its endemic anti-Jewish boycotts were always hatched in democracy’s name, many spearheaded by the National Democratic Party – notorious as Endek, its Polish acronym. These boycotters, upholding their rights as Americans, emulated the old country’s innate penchants. Strangulating elementary Jewish subsistence was Poland’s time-tried recipe for ridding itself of poverty and backwardness. Polish boycotts received official sanction in 1920, when Endek leader Wladyslaw Grabski took over as prime minister. He made Jewish life miserable via a variety of nasty measures. Unobtrusive among them was the boycott-enhancing edict obliging all store owners to display oversized signs bearing their surnames over shop windows. This expedited the identification of Jewish establishments, which could then be singled out to facilitate a legitimate democratic boycott. For reasons of political correctness, we won’t enter the minefield of Nazi boycotts. Analogies with Hitler’s Germany are the exclusive preserve of the enlightened Left. Suffice it to say that the Third Reich’s prototype inspired escalation elsewhere – including in Poland, where picketers asserted their rights to free speech by harassing Jewish vendors and their non-Jewish customers. In 1937, Poland’s last prewar premier, Felicjan Slawoj-Skladkowski, quipped in the noblest democratic tradition (so unlike our own Binyamin Netanyahu): “Economic boycott? Please!” Poland’s anti-Jewish boycott was eventually dubbed “the cold pogrom.” Shortly before the Holocaust, multitudes of anyhow mostly poor Jews, with nowhere to go, were bereft of their livelihood. Anti-Semites habitually recommend “hitting Jews in their pocketbook.” Which is probably why the Arab League has adopted this ploy against the Jewish state, and why the Palestinian Authority last year instituted its own boycott. PA Prime Minister Salam Fayyad had personally tossed “settlement products” into huge bonfires, to the approving whoops of onlookers. With such venerable role models, how could our own leftist sophisticates resist doing the same? Israeli professors, authors, filmmakers and artistes relish whipping up anti-Israel passions abroad. It’s not purely ideological. Such activity is lucrative. It assures academics a hearty welcome in the most prestigious campuses – if they only vilify Israel vehemently enough. It helps sell books and movies, stage shows and mount exhibitions. Advantageous for their advocates, boycotts are indeed beautiful. If our Left insists on the legitimacy of boycotts, we should all cheerfully concur. Were it not for the detailed blacklists peaceniks compile, we might not figure out which pickles and pretzels were produced on Jerusalem’s out-of-bounds outskirts and which fine wines are verboten. But now we can use the boycott database to buy precisely what they seek to ban. Moreover, the beauty of boycotts doesn’t end here. We can instigate counter-boycotts. Once the Left has given us the green light to boycott targeted segments of Israeli society, we might, theoretically, boycott Israeli-Arab businesses and workers. That would obviously be the quickest way to delegitimize boycotts. They will suddenly lose their attractiveness and democratic sheen. What’s acceptable against some Jews would be decried as rank racism if employed against non-Jews.This is the immutable postulate of asymmetry. That said, nothing prevents us from inconsiderately turning any adversity into a double-edged sword. and I can take or leave it if I so feel. …and you can do the same thing if you will. Boycott is a form of aggression, because it is aimed to harm its target and it has to be exposed as what it is. To boycott the “settlers” is an act of aggression directed against the Jewish inhabitants of Judea and Samaria and anybody who supports these measures is engaged in the business of the destruction of the Jewish state. The whole concept of boycotts seems to be so attractive for the retarded adherents of political correctness, because it spares them the aggressive attitude of rock throwers, but it is as bad as that and it is not beautiful but disgusting ! Where can I find such a list to use and distribute? A terrific idea to turn it against those who seek to harm us with their ‘holier than thou’ ramblings. Judea and Samaria are Israel. I also want such a list ! These individuals suffer from a shallow Jewish identification, and do not respect themselves and heritage. Low Jewish self esteem. I believe Mr. Phil Lipofsky’s words sum it all: “Boycott is a form of aggression”. Then how one defines a situation where boycott is retaliated with counter boycott? Where does the one ends, and when does the other starts? There are not mere rhetorical questions, we are dealing here with severe material, juridical and economic consequences, and with maybe more severe demonization extensions that will degenerate into further material, juridical and economic restrictions. All this in encapsuled in the hallowed right of free speech, which should not be taken slightly. As much as “they” have a right to free speech, “we” have a right to free speech. There is not text book solution. What is needed is leadership. A leader will know how to appraise a situation, whom to consult with or not, what “truth” should be uttered, or what “lies” should be released and how. I say a leader, not a despot nor a dictator. I apologize for too many quotes. The crux of the matter is that we, Israel as well as the rest of the world, need leadership to get us through these times. But not leadership for “ever after”, just for now. Let us not confuse the means with the mission. The aggression against Israel that has boycotts as just one of the weapons they seek to apply against it has no legitimacy. They have no honest complainst against Israel and where ever they place their aggression, it is unjust. “I must have subliminally succumbed to all that high-minded leftist palaver about boycotts constituting a legitimate form of free speech.” Who indeed could resist the tireless, relentless 24/7 State Media onslaught on dissenters in the name of democracy? If you harbour a different opinion, you’re obviously an enemy of free speech and should be branded accordingly, ostracised and (admittedly in extereme cases only), forced to undergo a re-education programme, to make you understand democracy better. We’ve received numerous requests for the product boycott-lists which leftist organizations and the Palestinian Authority disseminate here and abroad. These lists can be used in a reverse fashion to that which their compilers intended. We can deliberately opt to buy precisely what we’re exhorted to shun. Following is the full Arabic pamphlet circulated in the Palestinian Authority of boycotted Israeli products (note that a new Palestinian law decrees imprisonment for any Arab who buys Israeli goods from the Golan Heights, Jerusalem or Judea and Samaria).